I sat in disbelief today as I watched the news roll in. As the fire ravaged Notre Dame, my heart hurt. About a year and a half ago, Matthew and I spent a week in Paris to celebrate our 5th anniversary. As first time visitors to Paris, we spent our days visiting as many museums and historical sites as we could fit in. Notre Dame was on our list, but it was low on the list of places that we had to see. I am so thankful that we made a point to visit this beautiful cathedral on our final day in Paris. As we waiting in line to enter the cathedral, we marveled at the incredible detail that covered the entire facade. Curious about the history of the church, we did some quick googling and were in awe of the fact that construction had begun in 1160 and took almost 200 years to complete. The shear magnitude of the structure blew us away as we talked about the technology that was available at the time it was constructed, and the overwhelming details hidden in every surface were remarkable. This is a structure that stood for over 800 years, through the Napoleonic Wars, the French Revolution, two World Wars, and much more. When our time came to enter, I was overwhelmed by the significance of the space. Obviously the cathedral holds a great deal of religious significance, and the reverence held within the space was beautiful. And as a history fan, I was in awe of the life that this building had seen and held within its walls, the incredible labor that was required to create such a masterpiece. Beyond that, the architectural and artistic significant were staggering. 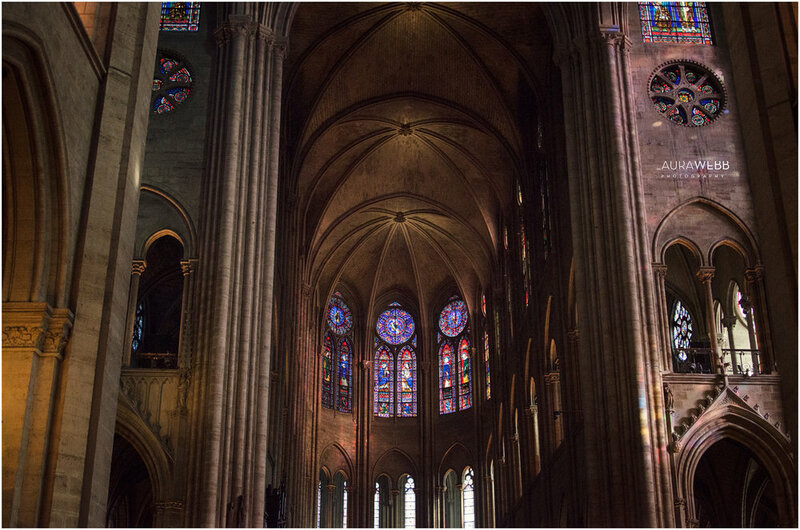 Each pane of stained glass filled with intricate biblical scenes in amazing detail, the light streaming through the colors and reflecting on the beautiful stone walls, the incredible details of the gothic architecture—there was so much to see and appreciate. Though it may have been on the bottom of our sight-seeing list, I am so incredibly grateful to have been able to experience Notre Dame and appreciate its magnificence. When we arrived home , I had hundreds (maybe thousands) of images from the trip, and while I was excited to see them, I couldn’t bring myself to start editing them. It was as if by editing them, somehow the trip would really, truly be over, and I didn’t want to admit that it was over. But today, when I heard the horrifying news and watched as this iconic Paris landmark went up in flames, I knew the time had come to work through my images from our visit to Notre Dame. And while my heart is broken for the people of Paris and the great losses of such an incredible monument in religion, art, architecture, and culture, I feel to grateful to have had the privilege of having been able to witness the beauty and inspiration of Notre Dame firsthand. So while I’ve hidden these images away so that I could personally enjoy them, I’d love to share with you some of the images that I was able to capture during our short time at Notre Dame.